The aim of this article is to explore ways in which community building can be integrated into the practices of juvenile justice work. It begins by discussing how the extent of community cohesion and societal resources at the neighbourhood level has a major bearing on the propensity of young people to engage in criminal and anti-social behaviour. The article then describes recent trends in the area of `restorative justice', in which the main focus is on individual offenders repairing social harm via juvenile conferencing and through active recompense measures. 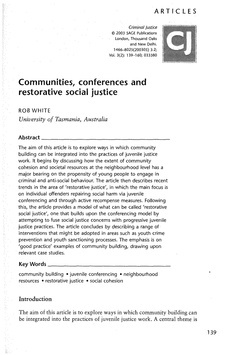 Following this, the article provides a model of what can be called `restorative social justice', one that builds upon the conferencing model by attempting to fuse social justice concerns with progressive juvenile justice practices. The article concludes by describing a range of interventions that might be adopted in areas such as youth crime prevention and youth sanctioning processes. The emphasis is on `good practice' examples of community building, drawing upon relevant case studies.